Movad is a print production company focused on short run, personalized, segmented direct mail. Since 1986 we have been helping non profit organizations with fundraising efforts. From New York to Washington DC, over 200 organizations rely on Movad to bring innovative ideas to help them increase response rates of their direct mail projects. "The leader in match mail accuracy." What is match mail? Simply put, match mail is ensuring that the name on the envelope, letter and all corresponding pieces are all the same. John Doe on the envelope, letter and response envelope. To date Movad has produced over 8,500,000 pieces of match mail without a single mismatch. Partner with an Award-Winning print and mail service provider. Movad is excited to announce that we have been honored with a Certificate of Merit in 2015, and an Award of Recognition in 2013 from the Premier Print Awards from the Printing industries of America. 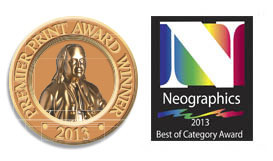 We have also been awarded the 2013, and 2015 Neographics Power of Print "Best in Category" award for "Digital Printing Variable Data." by the Graphic Arts Association. Click on the image below for more info.